Why Do You Need a Robot Clipping Your Grass? How do Robotic Mowers Know Their Mowing Perimeter? Keeping the lawn neatly trimmed and healthy is tough work. If you’re not in a position to hire Jack or Tony to do the heavy mower pushing, you will end up sweltering in the hot sun trying to clip the grass right as everyone else relaxes in the shade. Well. At least that was the case before robotic and remote-controlled lawn mowers came to life. The robotic mower, be it an Husqvarna, a Bosch, a Flymo or a Worx, will deliberately crisscross your yard trimming the grass to the preferred length without forcing you to follow it or ride it to get the job done. The programmable mower uses a couple of sensors, a virtual perimeter wire or GPS and an intelligent on-board computer to define the mowing areas before creating the perfect grass cutting pattern that will cover the entire area in the most energy efficient way possible. When I first heard of robotic mowers, I dove straight into the comparisons since I had used robotic vacuum cleaners before and was confident the mower would be a great investment. If this is how you feel, check out this brief comparison list of the top 8 robotic mowers in the market right now. Cutting Height of .7″ to 2″ (2 to 5 cm) setting with a rotary knob. Robotic lawnmower perfect for all garden types. Easy to use, easy to install, easy to maintain. Must be bought with Install Kit or it will not run. I could come up with a thousand and one reasons as to why you need a robotic mower other than the fact that they are a sheer bliss. The idea of going on with your life as your loyal robotic handyman takes care of your turf is simply convenient. It is a safe alternative to setting aside weekend afternoons to manually mow the lawn. The mower will be an excellent investment that will not only save you the cost of doing the lawn mowing but also save on the money you’ve been paying to have someone take care of your lawn. I hated the monotonous chunk of my old gasoline mower and the steady whack of its dull blade on my lawn. It always forced me to grab my head in agony upon noticing my uneven mowing no matter how hard I tried. The robotic mower is a finely tuned machine that will maintain an even cut without bugging you. It will make it’s way around the tight spots and hum away silents leaving you free to enjoy the neat lawn and a happier life. What could you do with 5 extra hours? Read a book? Watch a couple of episodes on your favorite TV show? Teach your son how to ride a bike? The list is endless. The time you save by letting the mower take care of your lawn can be an investment in more profitable social or economical activities. It is free time since you won’t have to pay the mower to clip your lawn. Standard lawn mower safety features include automatic shut off when tilted over, out of order or when the mower encounters an obstacle it cannot avoid. Most of the mowers are intelligent enough to safely reverse from trees or benches and more in a different direction while a complete mower guard keeps the blade out of sight and protects your property and loved ones from flying stones. Most walk-behind or ride-on lawnmowers are very heavy. They will leave ruts in your lawn especially if you clip your crass when it is still wet. The undue pressure on the lawn is against the best lawn keeping practices as it denatures your turf disrupting growth. 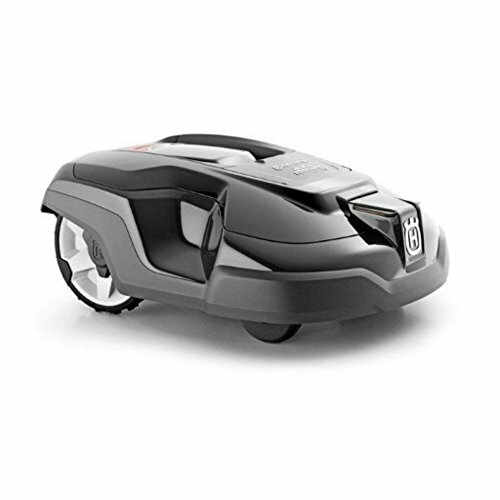 The light and gentle robotic mower not only treads gentle but also doesn’t fling the grass clippings to far away. They are left as tiny bits that are ready to mulch the lawn and turn into manure. No raking or sweeping is needed once you are done mowing. Your robotic mower is small enough to efficiently run on an electric motor. This means no petrol, no oil and no emissions. The mower is also silent letting you live your life or hold a conversation even when it is working its magic next to you. Most of the energy-efficient robotic lawnmowers will require less than $20 per year to keep an average lawn neat. This is quite the savings compared to how much you will spend to pay someone who uses fuel on your old internal combustion engine mower to trim your yard. Nothing is as off-putting as an overgrown lawn. This is bound to happen if you keep postponing your mowing. This is a common thing that most of us do. You no longer have to worry about this with a programmable robotic mower. You can schedule it to regularly trim your grass during the low activity times to avoid interference. All you need is to keep it charged and it will maintain the schedule for as long as it is serviceable. When I first bought my robotic lawnmower, I was too excited to dig deep and evaluate all the tiny details that determine the best mower for your home. I am lucky that my lawn back then wasn’t so huge or loaded with complex landscaping. The simple GARDENA 4069 R80Li was enough for my 7000 square feet lawn. Not everyone will be this lucky. Here are some of the things you should consider when purchasing yours to avoid ending up frustrated. A standard safety feature shuts down most mowers whenever they overturn or the cutting blade hits a snag. An intelligent mower uses a complex set of gyros, sensors and navigation software to avoid bumping into obstacles and getting into a tight spot in the first place. 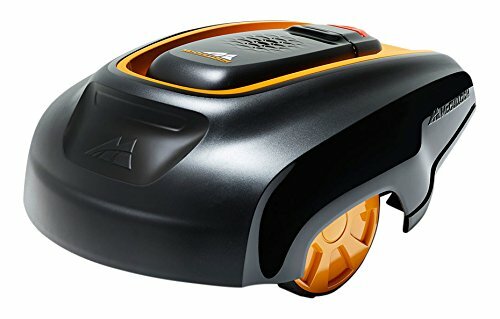 Get a robotic mower that can reverse out of obstacles, mow around them, make its way back to the charging dock and stay on its feet for as long as possible. If you were keen, you will notice that I quoted the lawn size my GARDENA had to mow. Most of the robotic lawn mowers have a maximum mowing radius. Measure your lawn area and get a robot that can easily cover the entire area within a reasonable amount of time. An intelligent automatic mower can work on different zones without having you move it from one location to another. Imagine having to mow the area next to your driveway. The mower has to cross the paved driveway to mow the other side. You will also want the robotic mower to head over to your backyard and do some trimming there too. Multi zoning allows you to program ll the three zones and the mower will automatically move to the next zone and get to work without shutting down and waiting for a new zone setting. The majority of the high-quality lawnmowers will have a built in program for clipping sessions. You can set the dates and time when your mower will cut the grass. This means that your lawn will stay neat even if you are away on holiday or too busy handling business to remember the mowing dates. You don’t really have to choose an automatic mower simply because it is cheap. While price is an important determinant when looking for an automatic mower when on a tight budget, you should always aspire to get something that is reliable and will go for longer before breaking down. It is always better to spend extra bucks on a reliable piece that will keep working for longer. This will save time and more often than not cut on repair and energy consumption costs. I get a lot of questions from people who want to know how robotic mowers know their mowing radius. Most of the guys I talk to are familiar with the perimeter wire approach since this is what most of the first-generation robotic lawn mowers used. There are a few other technologies that will keep your mower from straying into swimming pool or extending its gratitude by taking care of your neighbor’s lawn. It’s not odd for robotic mowers to borrow a leaf from iRobot’s Roomba robot vacuum concepts. The idea behind this was to use radio pods to generate the signal that an onboard receiver can use to triangulate its position. This technique didn’t really catch on since the potential interference from the transmitting pods is quite high. The alternative virtual perimeter solution uses visual cues and a smartphone app to help you create a virtual perimeter. You will have to work around the perimeter of your lawn with the mower remote or a smartphone with the right app installed to define the perimeter. SmartMow is the pioneer to this concept. The approach seems quite straight forward. Learn the perimeter by being shown the perimeter. Robotic mowers using this technology will still have on board sensors to help them navigate around an object while on duty. GPS is the most reliable positioning technology on the globe right now. Everything, from cars to planes, ships and farm machinery use GPS to find their way around the world. So why shouldn’t robot mowers try this too? Well, most of the most efficient mowers do. Top models like the Husqvarna Automower will even let you use a mobile app to find it on your lawn. The only thing is very few lawnmowers are 100 percent dependent on GPS. Most of them will have a fallback guide wire in case the GPS fails you. I wouldn’t rile them for being too careful. My GPS locator sometimes goes haywire. I wouldn’t want a rogue robot mower running rogue in my backyard with nothing else to stop it from doing something stupid. Even though this sounds rudimentary, it is still the most reliable and popular fallback plan when it comes to running a fully automated mower. The underground perimeter wire uses RF technology similar to what you will find on those wireless dog collars that will keep your dog from dashing out into the rod. A perimeter wire is buried around your lawn and the mower will be processing signal from this wire and it will stop and turn back the moment its too near or if it gets to the wire. The final navigation type is the loosest you’ll ever find. Robotic mowers relying on sensors will keep mowing as long as they don’t encounter a wall or a barrier. This makes them perfect for plain lawns that don’t have hazards like a swimming pool or a water feature. The lawn should also have an enclosing fence to keep the mower from straying off your property while any landscaping should be protect by a low embankment to keep the mower off. 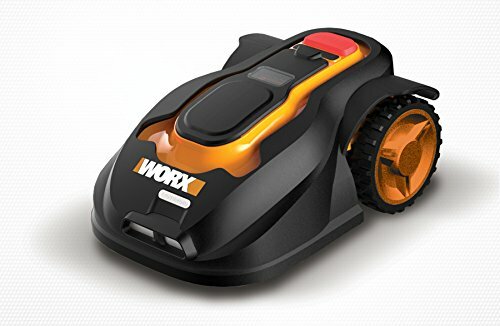 Since the mower doesn’t really know its location relative to the entire lawn, it cannot trace its path back to the charging dock hence you will always have to carry it back to indoors for charging. The idea of a busy robot chugging up and down my lawn chewing the grass is exciting but chilling. I wouldn’t be so comfortable knowing that a couple of sensors is what is keeping the mowers from jumping into the swimming pool for a dip. How safe are robot mowers? The answer to this is one of the reasons why most people shun these automated lawn managers. Can you trust a robotic helper enough to let it take charge of your neat lawn and trust that it won’t go rogue on your favorite cat, mess up the plants or mow too close to your leg? Well. You can. There is nothing to worry about since robotic lawn mowers are quite safe. All you have to do is treat them right and focus on these safety tips in order to make your home a safer place to be. Always inspect the lawn mower on a regular basis and repair or replace anything that is damaged. Keeping your robotic mower in the best condition possible will improve its efficiency, sensing ability and safety. Don’t let your kids or pet sit on or ride the robotic mower as it works. The extra weight will weight down the mower making it strain to get the job done. Always go for the highest quality automatic mower you can afford. The better the lawnmower the higher the chances that it will be reliable and very safe. Robotic mowers might have a couple of safety tips that will turn it off whenever it encounters an obstacle or it is in the wrong operating position. This doesn’t mean that you should push it to the limit. Teach your pets and family members to stay clear of the mower whenever it is working. Better still, you can schedule it to work during odd hours when people are least likely to get in its way. Get a mower with a remote control or a mobile app. You will need something that can send a kill command to the mower in case things go wrong and you can’t get to the mower in time to manually override it. Robotic mowers are not as adaptable as other mowers in the market. With poor maintenance, you will easily see your precious investment go down the drain. However, caring for your robotic mower is not that complicated and you don’t have to be a mechanic to having a buzzing mower. The following are some of the basic maintenance tips that you should always consider when caring for your equipment. The best and sure way of maintaining your robotic mower is by first making the right purchase. Genuine and high-quality brands cost a fortune. However, they are worth every penny of your investment. Since quality manufacturers have a reputation to maintain you are confident with the parts and process used in manufacturing your robotic mower thereby guaranteeing you quality results. A product’s manual is a guide on how to operate and care for your product. It is always in the best interest of every manufacturer that their clients are happy and satisfied with their product. Therefore, start by reading through your robotic user manual and see how the manufacturer wants you to install and operate the equipment. Doing this will guarantee you sustainability. Replacing your robotic mower’s blade is vital to the productivity of your equipment. Since your mower’s blade wear and tear off over time you should consider replacing your mower’s blades frequently. Some of the factors that will determine the frequency at which you change your mower’s blade include, your lawn’s size and your duration of use. If you use your robotic mower frequently and on a large lawn then you need to replace your blades at least thrice a month. Inasmuch as robotic mowers do not clog their undercarriage as their traditional counterpart, frequent cleaning should never be overlooked. Immediately after use and before storing your robotic mower, ensure you clean and wipe it dry. Remember also to clean and store indoor it’s charging station. The perimeter wire can be left in the lawn as it does not get affected by the harsh weather condition. Robotic mowers are a revolution in home care. With no efforts whatsoever, you will always be guaranteed of properly cared lawns. However, for you to enjoy the many great benefits of a robotic mower all year round, you need to ensure they are well cared for. Consider the above tips as part of your robotic lawn mower care regimen.